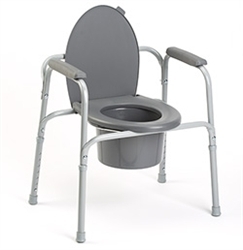 This is a deluxe commode that comes with a grey powered coated steel. It has a snap-on seat and lid that has three versatile functions and also includes a bucket, lid, and splash guard. This has an adjustable height, comes fully assembled, and has a 2 year warranty on the frame.